Day four of the sickpocalypse. My new treadmill is taunting me, and so is the sun. I want to run, but just walking to the kitchen for a bottle of water and a piece of fruit wears me out and makes me dizzy. 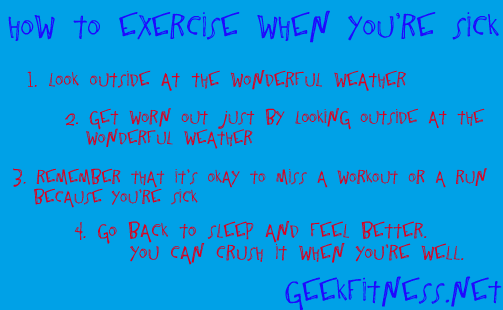 I have to remember that it’s okay not to exercise. Just like rest days during your training routines, sick days are not optional days off. Your body has to heal. Don’t push it too hard. Or if you’re like me, don’t push it at all. The road, weights, treadmill, whatever will still be there when you’re well. The road can wait; your health can’t. Take care of yourselves! General running rule is that if your head is sick (and you want to), you can still run – but if your chest is sick, then no running allowed. I’m a big fan of rest, sleep and vitamin C myself. The faster you get better, the faster you can get back out there. My entire body was sick this time. And I learned your rule the hard way–my chest had a staph infection on it, and between that and the antibiotics, my body yelled at me hard when I kept trying to push it. I was feeling a lot better yesterday, but today has me back down in the dumps. I can’t wait to get the results of my test in to see what it is. If you can’t exercise physically, you can exercise your mind! The best way to do that? Read Nimbus! I just read this after having found you on Fitocracy. I just got injured about a week ago from (and this is the doc speaking) too much walking (march fracture). I was always aiming for 10.000 steps a day and thanks to my job it was quite easy to manage. On top of that I play tag rugby once a week. Only days before the injury I was planning on buying shoes to start running. I know it’ll be harder now to get back into everything (once I’m ready in at least a month). I hate not being active and feel so lazy and extremely tired from walking on crutches. Do you have any recommendations for getting back into exercising and especially running after such an injury? Eve, so glad you found your way here, but I’m terribly sorry to hear about your injury. It’s going to be hard to get back into everything, but remember you’re not being lazy and inactive: you’re recovering. You’re healing. You just need to make sure you don’t exacerbate your injury and make that recovery take even longer. For me, when I’m coming back from sickness or an injury, I try not to look forward. I look at what I was doing 2-3 weeks BEFORE I took off and try to do that. Sure, it sets me back in my plan a bit, but it also keeps me at a level where I’m probably not going to injure myself all over again. If you were pushing yourself to hit 10 steps, be okay with getting 6k one day, 7k the next. Just work your way back up to where you were. If you do that, I don’t expect you to have too many problems. And if you are tired from the crutches and still need to be active, have you tried any upper-body work with weights or yoga poses that don’t put strain on your legs/feet? I know that when I couldn’t run, doing an hour or two of yoga each day really helped me keep sane–if you’ve never tried it, I’d look into it. There’s some massive burn involved in yoga. Another way to ease back in is swimming. Is there a pool you can use once you’re back on your feet? By doing laps there and strengthening yourself back up without the impact on the ground, you can get your lungs back to where they were before your injury. I’m so used to being active and my head and body needs it. My body is taken care of due to the exhausting task of walking on crutches. My head isn’t really taken care of. I’m a nanny, so getting to and from work and a daily walk to and around the park easily gets me to 10.000 steps without pushing. Today I was on 2.500, which is the minimum of what I need to do. Swimming would be a good idea, there’s one “down the road”, still a 20 minute walk each way under current conditions. But yoga sounds like a great idea, hadn’t thought about that, I will definitely look into that! And once I’m better but not good enough for the rugby (or running in general) I will start swimming. Read through some of your posts and they’re all so helpful without any of the usual bs… Thank you so much again!